Other cities, of which the commissioner specifically named Charlotte, Las Vegas, and Phoenix, will have to await the next round of expansion, which league officials have previously indicated could be completed by 2026. This is all in keeping with MLS’s long-established business model: Keep handing out new teams every year or two, at a pace geared to ensure a steady flow of expansion fees while still keeping enough cities interested that the league can levy demands — namely, for new publicly subsidized soccer-only stadiums — in exchange for granting franchises. (Lucrative naming rights deals, apparently, will be the new tiebreaker.) At least, except when it’s presented with owners it craves enough to be worth waiving that rule, which was the case with NYC F.C. and Atlanta United but not with Detroit for some reason. Garber called the competition good for the league. “Life is good when you have options.” That one really needs to go alongside Jerry Reinsdorf’s “A savvy negotiator creates leverage” in the sports shakedown Hall of Fame. One big draw about the proposed Sacramento soccer stadium is that it doesn’t call for a large, direct taxpayer subsidy. That is a line that shouldn’t be crossed as city officials and Republic FC owners try to beef up their bid for a Major League Soccer franchise. Now that’s more like it! The team owners promised to build a stadium themselves, and City Hall shouldn’t let them back down on that just because MLS is withholding a franchise in hopes that the ownership group can come up with more cash. (Their cash, new investors’ cash, the public’s cash, MLS seems pretty agnostic on which they prefer.) This is good stuff, what does the next paragraph say? Mayor Darrell Steinberg is on the money: It could make sense for City Hall to reduce or defer some building fees, to donate land for a training facility, to give the team the revenue from new digital billboards, or to help with roads, sewers and other infrastructure near the stadium. 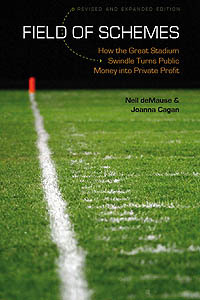 Let’s say it all together: MONEY IS MONEY, SPORTS TEAM OWNERS DON’T CARE HOW THEY GET IT. If very rich dude Kevin Nagle can get a pile of tax or fee breaks or free land or a pile of billboard revenue that would otherwise go into city coffers, that’s going to be just as fine with him as getting city checks with “4 STADM BLDG” written in the memo field. To pretend there is any moral or fiscal difference is, well, the kind of thing you do when you’re a mayor and want to propose a sports team subsidy but don’t want it to look like one. Or if you’re a newspaper that wants to do the same, I suppose, but you’d think their copy editing department might have balked at using “hold the line” to describe it — if the Bee still has a copy editing department, that is. If there’s been one given in the insane world of MLS expansion, it’s been that the Sacramento bidders were promising to come up with private money to pay for the entire cost of a $245 million stadium. Except that Sacramento didn’t win a expansion franchise last month as had been anticipated, reportedly because the league was worried that the prospective owners couldn’t afford a stadium on top of a $150 million expansion fee, and you know where this is headed, right? Sacramento city leaders and the local ownership group seeking an expansion spot in Major League Soccer are discussing public contributions to a new $250 million soccer stadium planned for the downtown railyard – conversations that eventually may include a request for a direct public subsidy to the project’s construction. This was probably inevitable given the way MLS was running its expansion bidding: Setting expansion fees as high as possible, then picking winners based less on what’s the best soccer market than on which was offering the biggest guaranteed subsidies. (While two expansion teams were supposed to be announced last month, only Nashville got the nod, and it can’t be coincidence that Nashville was the only city among the finalists that had approved $75 million in public cash.) For a while it looked like Sacramento would sneak through on the basis of having a new stadium even if the owners were paying out of their own pockets, but MLS’s determination that “No, we want a team that can afford to pay us $150 million so we can keep funding our league by selling rights to more teams for big bucks, and yet still have lots of money left over for team profits, which isn’t going to happen if you’re on the hook for all stadium costs” put a fork in that, so now it’s back to the subsidy drawing board. What that subsidy could look like is anyone’s guess: Mayor Darrell Steinberg mentioned reduced building fees and free land for a training facility as possibilities, which don’t sound too bad until you remember that Steinberg was formerly the California state senator who wrote a bill to fast-track the Kings arena by exempting it from environmental challenges, so he doesn’t exactly have a great track record in protecting the public interest. Steinberg also said, “I’m confident we can get Major League Soccer without a major public construction or operating subsidy,” and if you’re concerned by that qualifier “major,” you’re not the only one. No, you’re right, that’s not an answer at all. California’s tough laws allowing referendums to block sports stadium spending may be an obstacle to any team subsidy demands here, but it might be a good idea for Sacramento residents to put one hand on their wallets, just as a precaution. Friday roundup: Trump rescued stadium tax break, Sacramento MLS group needs more cash, more! San Diego Union-Tribune columnist Kevin Acee, who never met a stadium or arena deal he didn’t love to bits, says that several people are interested in building a new arena in San Diego, including the owners of the Padres and new Brooklyn Nets minority owner Joe Tsai. Acee adds, “Several people insisted in recent weeks the Nets will remain in Brooklyn long-term and there are no plans to ever move the team to San Diego,” which, given the relative size of the markets, is possibly the least surprising sentence ever written in the English language. Also, Acee includes zero attributed quotes in his story, and says nothing about how such an arena would be paid for, so take it with a large grain of salt for the moment. Donald Trump made retaining the tax-exempt bond subsidy for sports stadiums in the tax bill “a priority,” according to one GOP aide. So when he tweeted in October, “Why is the NFL getting massive tax breaks while at the same time disrespecting our Anthem, Flag and Country? Change tax law!”, either he didn’t mean anyone to take him seriously just because he was the president of the United States speaking out on a matter of public policy, or more likely he just forgot to check with his funders before clicking Tweet. “The Miami Open tennis tournament won permission to move to the Miami Dolphins’ stadium, with the kickoff planned in 2019,” reports the Associated Press, which seems to be slightly confused about how a tennis match starts. After the NBA used the promise of an All-Star Game for Cleveland in 2020 or 2021 if it approved publicly funded arena renovations for the Cavaliers, and the city approved $70 million worth, the league gave those games to Chicago and Indianapolis. Not that there’s really that much value in hosting an NBA All-Star Game, but still, HA ha, suckers. Apparently the reason why Sacramento didn’t get an MLS expansion team along with Nashville this week is the league is worried the city’s ownership group doesn’t have enough cash for a $150 million expansion fee and a $250 million stadium. All they need is to find someone with deep pockets who thinks the best thing to do with their money is to invest it in a U.S. soccer franchise that will start off $400 million in the hole, and, well, good thing that P.T. Barnum movie is opening this week, that’s all I can say. There’s a “Plan B” stadium proposal for the Pawtucket Red Sox, where instead of helping to fund the stadium directly, the state would instead give the city all income and sales taxes collected at the stadium and let the city use the money on construction costs. Rhode Island state senate president Dominick Ruggerio says he doesn’t “see that as being a viable alternative,” and plans to submit his own stadium-financing bill, which probably won’t pass the state house. This could go on for a while, until somebody remembers where they stored the money generating machine. The Arena Football League is now down to four teams, in part because the Cleveland Gladiators had to suspend operations for the next two seasons thanks to renovations to the Cavaliers’ arena. This was reported in the Albany Times-Union, which has to care because Albany is supposed to be getting an AFL expansion team this year, and man, do I feel sorry for whoever got stuck with being the Times-Union beat reporter on this team, because this is looking like a sad year ahead for them. NHL commissioner Gary Bettman spoke out again about the Calgary Flames arena situation, calling it “very frustrating” and saying that “they’ll hang out and hang on as long as they can and we’ll just have to deal with those things as they come up,” but insisting that “yes, Quebec City has a building, but nobody’s moving right now, we’re not expanding East.” Which either means the Flames owners really don’t want to threaten to move right now (or ever), since making overt move threats is usually Bettman’s job, or it means even Bettman is sick of trying to pretend that the Flames have a viable threat to go anywhere. Sacramento, which has pretty much been considered a lock given that its USL team has strong attendance and it’s already started clearing land for a new stadium to be built with private money. Nashville, where the city government just promised $75 million plus free land for a new stadium, so you know that’s going to be hard for the league to pass up. Cincinnati, whose USL team has gangbusters attendance in their existing stadium, and owners have offers of $50 million in city and county subsidies but are holding out for $75 million. Detroit, where Pistons owner Tom Gores and Cleveland Cavaliers owner Dan Gilbert have given up on their crazy $300 million public subsidy plan and are instead looking to place an MLS team in the Lions‘ Ford Field. So, Cincinnati and Detroit could be in there as fallbacks in case MLS needs a last-minute sub for Miami. Or, Leiweke could just be saying this as leverage to get the final hurdles cleared for a Miami stadium, and this really is still a four-to-get-two situation. In which case the final verdict will say a lot about MLS’s business model: If it’s Sacramento and Nashville, we know that anybody with a $150 million check and a soccer-only stadium deal will get the nod; if it’s Sacramento and Cincinnati, we know that MLS is looking to where there’s the most established fan support; and if Detroit is involved at all it’s either because of the allure of a more major media market, or the allure of some big-money owners who can increase the league’s ties to the NBA, or who knows. A lot is likely to depend on how things play out the next two weeks in Cincinnati, where both the city council and the county commission approved $50 million in public stadium subsidies yesterday, but still nobody’s saying how that additional $25 million would be paid for. (Or even what the total stadium cost would be; the gap could end more than that.) And also in Nashville, where the group Save Our Fairgrounds filed suit yesterday to block construction of a new stadium at Fairgrounds Nashville. Maybe hedging with four finalists isn’t a bad idea, in other words, but picking a final two (or three) two weeks from now is going to be anything but an easy task — I guess asking the four bidders to throw money on the table until two have emptied their pockets would be too unseemly? Garber: next round of expansion we have to get right. If we can’t get it right in December, we’ll delay it. A league spokesperson later texted, according to ESPN, that “MLS remains on track to name two teams in December, with an announcement ‘likely around Dec. 19-20. '” But that’s still hedging, in a way that could probably best be taken as We’re planning an announcement the week before Christmas, but we reserve the right to change our minds. What could be going on here? Soccer Stadium Digest thinks that MLS wants to be sure that David Beckham’s Miami franchise will actually get stadium approval in time to begin play next year — the stadium won’t be done by then, mind you, but MLS will award a team so long as it has a stadium deal in place — or else award a franchise to a fallback city in order to keep an even number of teams. That’s certainly possible, though MLS has operated with an odd number of franchises before, so it could always just push back Miami’s entry another year or three if necessary. Equally possible is that MLS may want to wait out the legislative process in some potential expansion cities to see what they can shake loose in terms of public stadium funding. Of the four frontrunners declared by Soccer Stadium Digest, Detroit Pistons owner Tom Gores and Cleveland Cavaliers owner Dan Gilbert’s $300 million plus free land and I’ll build Detroit a new jail to replace its already half built one plan still needs both city and county approval, Nashville S.C.‘s $75 million subsidy demand requires approval of the regional Nashville Metro council, F.C. Cincinnati‘s gambit for that city to pay for half of a new $200 million stadium hasn’t seen much action in recent months (other than a new Cincinnati citizens’ group petitioning Garber to let the team move up to MLS while still playing at Nippert Stadium, where it’s setting attendance records), and Sacramento F.C. has already started clearing land for a new stadium, though with actual construction not scheduled to begin until 2018 the team owners can always slam on the brakes if they don’t get awarded an MLS franchise by then. That’s a whole lot of uncertainty, and could easily be a reason why the league doesn’t want to set an expansion announcement date in stone. When running a bidding war, it’s a fine line between wanting to scare the participants with a countdown clock, and wanting to make sure they always have enough rope to up their bids. The team’s original plan was for a $175 million stadium where $101.25 million of the costs would be paid off by the county, with the team repaying the public via $4.25 million a year in rent payments. (Note to readers who can do math: No, $4.25 million a year is not enough to repay $101.25 million in bonds unless you get a 1.5% interest rate, which I know they’re low but get serious.) Now they’ll instead have to try to hit up the city of Charlotte alone, which has already indicated that its maximum contribution is $30 million. That would leave the team to shoulder $145 million of the cost, plus MLS’s nutso $150 million expansion fee, which is a hefty chunk of change. On the other hand, the team wouldn’t have to make those rent payments, so maybe it could just go to a bank and borrow the cash, and make mortgage payments instead? Or maybe the rich NASCAR track heir who wants to launch the MLS team would rather have somebody else on the hook for loan payments if his team, or MLS as a whole, went belly-up at some point as a result of its pyramid-scam spree of handing out expansion franchises like candy to anyone who wants to pay $150 million for candy? Yeah, probably that. Charlotte: Can build a stadium, but needs to do it mostly on its own dime. Cincinnati: Has perfectly good old stadium that draws record-breaking crowds, wants $100 million for new stadium anyway, may or may not get it. Detroit: Rube Goldberg scheme involving $300 million in public funding and tearing down a half-built jail while building a stadium there plus a new jail elsewhere. Indianapolis: Has perfectly good stadium, wants public money for new stadium anyway, state legislature keeps laughing at them. Nashville: City considering selling $150 million in bonds to fund a stadium, to be repaid via we’ll get back to you on that. Phoenix: Ownership group swears up and down it can build a “climate-controlled” stadium without public subsidies, details TBD. Raleigh/Durham: Rube Goldberg scheme involving $91 million in state land and tearing down the state office buildings on it and building new state office buildings and somebody charging somebody rent or something. Sacramento: They have a site and a bunch of construction equipment ready to go, and say they can come up with $245 million for stadium construction out of their own pockets. San Antonio: Spurs owners cut a deal in 2015 to have the city and county buy them a minor-league soccer stadium, then if they get an MLS franchise, hold a countywide vote on providing money for upgrading it to big-league standards. San Diego: Rube Goldberg scheme involving getting $240 million worth of downtown land and infrastructure for $10,000 and then building lots of stuff on it including a soccer stadium, with a public referendum on this slated for November. St. Louis: Had its stadium-subsidy referendum already. It didn’t go well for the team owners. Tampa/St. Petersburg: Tampa Bay Rowdies owner Bill Edwards offering to pay $80 million to expand Al Lang Stadium, lease terms with city of St. Pete still to be determined. That’s a whole mishmash of stuff indeed, and I don’t envy the job of the MLS officials tasked with having to pick two winners this fall (and two more next fall, because they can’t cash those $150 million expansion-fee checks fast enough). You have to wonder if commissioner Don Garber doesn’t think to himself sometimes, maybe it’d be easier just to stick the expansion franchises on eBay and take the highest bids. It would mean giving up on the pretense that they’re actually selecting the best soccer cities or something, but get real, nobody believes that anyway. Nashville is looking to build a new MLS stadium, and Indianapolis is looking to build a new MLS stadium, and San Diego is looking to get a new MLS stadium, and Detroit is considering providing free land for an MLS stadium, and St. Louis is still looking to build an MLS stadium after rejecting it once, and a guy in Charlotte is still looking to have an MLS stadium built for him, and Tampa is looking to get an MLS franchise but already has a stadium. Anyway, with MLS set to announce four more expansion franchises in the next year or so, the league can probably count on some cities stepping up to throw money at new stadiums, so long as they’re not too picky about which ones. (Cincinnati, Raleigh/Durham, Sacramento, and San Antonio are also in the mix.) Bulk-mailing extortion notes is kind of a strange business model, but hey, whatever works. Major League Soccer is preparing to announce another round of expansion — this time to a whopping 28 teams — and is clearly determined to grab all the money it can in the process, as deputy commissioner Mark Abbott says the league is preparing to double its expansion fee to $200 million. That’s a whole bunch of money for membership in a league whose own commissioner says it’s losing money, and which Soccernomics author Stefan Szymanski has called a “pyramid scheme” that’s eventually going to collapse. Given that the leading counterargument appears to be that “no, no, even if teams always lose money owners will count on making money when the sale value of the franchise appreciates,” it’s exactly a pyramid scheme — the only question is whether it’s the kind of bubble that eventually collapses, or one that can continue indefinitely. The argument for the latter — and, presumably, the MLS business plan — goes back to the billionaire glut, which posits that there are so many rich people wanting to own a pro sports franchise these days, and such a limited number of opportunities, it’s going to be a seller’s market for the foreseeable future. With that the case, it’s understandable that MLS would want to get everything it can for new franchises while the getting’s good, even if it means becoming by far the largest soccer league in the world. (Most other leagues cap membership at 20 and relegate the teams that do the worst to a second division, something that MLS has resisted because it might limit the number of people lining up to sign expansion checks.) And with a list of prospective expansion cities that includes way more than they can possibly fill in this round — Sacramento, Detroit, Cincinnati, San Diego, St. Louis, San Antonio, Charlotte and Oklahoma City are all reportedly on the list — it makes total sense to weed out the winners from the losers by seeing who’ll balk at a higher price tag. Clearly this isn’t sustainable in the long run, but MLS isn’t thinking about the long run right now, which is its prerogative. If you’re a city thinking about building a stadium for a new MLS franchise, though, you might want to at least keep in the back of your mind that there’s a decent chance the league could, years down the road, eventually contract again — or at least split into upper and lower divisions — and that your shiny new team could end up without a chair when the music stops. Johnson appeared Wednesday to have softened his opposition and said he imagined the stadium as a public-private partnership. He pointed out the state has already invested million for roads and bridges in the railyards, but declined to say if would support a subsidy for the project. Cost of said stadium? Unknown! Who’ll pay for it and how? Also unknown! When Sacramento might actually get an MLS team to play in it? You guessed it! Johnson says he hopes to have all this worked out by the end of this year, which bwahahahahaha, damn, he’s a funny guy.